The objective of this text is to synthesise the research based clinical treatment strategies that have been found to be most effective in the clinical management of heart failure as a disease. Incorporating recommendations from state of the art guidelines, the text will comprehensively address both in-patient management of acute exacerbations, and out-patient management to improve survival, quality of life, and functional status. The editors are active members of the American Heart Association and influential councils on clinical cardiology and cardiovascular medicine, and have assembled a team of contributors prominent in the field of heart failure and transplantation. They aim, through this publication, to translate the findings of recent research into a practical clinical framework for physicians caring for patients on a daily basis. Mariell Jessup Hospital of the University of Pennsylvania. In addition to being prominent in the field of heart failure and transplantation, the editors are active in the AHA and appropriate councils on clinical cardiology and cardiovascular medicine. Chapter 1: Heart Failure as a National Heath Problem: The Burden of Heart Failure. Chapter 2: Heart Failure Guidelines and Disease Management. Chapter 3: Managed Care and Heart Failure. Chapter 4: Defining Heart Failure: Systolic versus Diastolic Dysfunction, Differential Diagnosis, Initial Testing. Chapter 5: Serial Clinical Assessment of the Patient with Heart Failure. 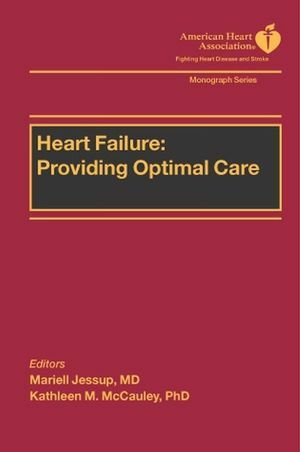 Chapter 6: Treatment Goals for Heart Failure Patients in Critical Care. Chapter 7: Managing Complicated In-patients: Co-morbidities and the Frail Elderly. Chapter 8: Transition from Hospital to Home: Interdisciplinary Management Models. Chapter 9: Living with Heart Failure: Promoting Adherence, Managing Symptoms, and Optimizing Function. Chapter 10: Pharmacologic Management: Achieving Target Doses and Managing Interactions. Chapter 11: Continuum of Care: Prevention to End of Life. Chapter 12: Surgical Management of Heart Failure. Chapter 13: The Management of Heart Failure’s Electrical Complications: Device Therapy. Chapter 14: Moving Ahead with Heart Failure: What does the Future Hold?